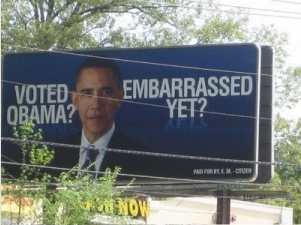 My heart goes out to all of the now embarrassed Americans who voted for Obama and had no idea who they were voting for or what he would do to our country. And I don't even mean that in a snooty, right-wing kind of way. I truly feel Americans who voted for him thought he would bring meaningful change. Barack's lack of experience in the private sector has made it impossible for him to understand what it takes to motivate small business, medium sized business, larger private business, and corporations. His inability to understand the banking system has put banks in a place where they won't lend money. His inability to understand that stimulating small parts of the economy is like pouring buckets of water on a forest fire and saying "See! The fire went out right here! I saved one tree!" His inability to understanding that a tax placed on ANY business is a tax that gets passed down to the customers of that business. And finally, his inability to understand that America didn't become the great nation it is today without a constitution that limits government, will insure that anyone who challenges him, will defeat him in 2012 after 4 painful and devastating years of his "service". But I have learned complaining doesn't get anybody anywhere. Getting out and voting is the only way Americans are going to get their country back. November is the first, and most important, step in balancing the power that currently exists in the 3 branches of government. Normally (whatever that means in 2010) I would recommend we just create balance so no one party can run rampant. But in this case my humble, gentle, suggestion is to throw every last politician who supports our President and his policies out of office so that we can begin to correct the things mentioned above. To win the lottery, we will need a complete swing of power the other way to repeal Health Care "Reform" and replace it with reform that keeps the federal government out of our personal lives. For those of you who voted for Obama...you know who you are...I have included 5 Steps on "How to Deal with Shame". Its embrassed people who voted Obama that they thought trusted him but end fool! Its Scam voted Obama is not US citizenship . Blamed those who account the votes and goverment each state faulted (favorsome) very wrong and why they do that for ? He is black Wheepee! Dishonored and Disgraceful! Goverment, Congress, Senate, Politics and white house faulted and cheated from started 1993 to 2008. Do we have trust to vote again ? that is scary! It will be harder to trust them and bit harder to listening to who will be election 2012 more cause to chose who will be president to do better to trusted and promise! nothing simple but, Human begin and Be honesty just do the job to help this USA NOT OUT OF COUNTRY !